Camarillo Springs Golf Course Hole 2: This big dogleg right hole wraps itself around a hillside and requires two well-distanced shots to score a par or better. Camarillo Springs Golf Course Hole 3 (right): This long par three has a lake on the left that looks fairly harmless, but the steep hillside just off the green will reject shots and send them rolling into the water. Camarillo Springs Golf Course Hole 4 (below): This relatively short par four features bunkers on the right of the fairway and lake to the left in the landing area. The second shot also features a lake left but the hole doglegs right around some trees. The green is narrow, angled and fronted by a series of bunkers on its right side. Camarillo Springs Golf Course Hole 10: For a big hitter, this is a birdie hole, as it is a short par five with a very wide fairway for the drive where it is tough to get into trouble. The second (or third shot) will play over a sloping hill from right to left to a partially blind green with a bunker on either side. The only really bad miss is long of the green where the shot can actually run out of bounds. Camarillo Springs Golf Course Hole 12: This par three is over water, but there is about 40 yards of room over the water. There are troublesome bunkers around this raised green, which is fairly undulating. Camarillo Springs Golf Course Hole 13: This par four runs along the freeway and there is also a lake to the right, so the hole begs the golfer to stay left off the tee. However, there is a large bunker short-left of the green, which slopes from back to front and left to right, so the easier approach is from the right, accomplished by flirting with the lake and the OB right of that. Camarillo Springs Golf Course Hole 15: This short par four features an elevated tee shot to a wide, but island fairway. Accuracy is the key, as even a long iron hit straight will leave an easy approach shot to the green. 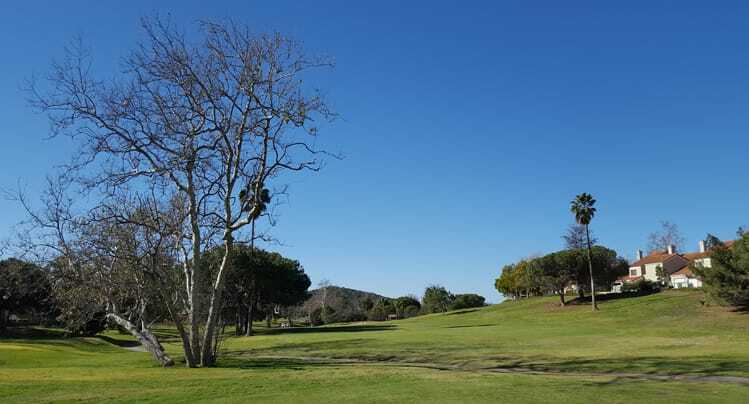 Camarillo Springs Golf Course Hole 16: A short, dogleg right par five over the water makes birdie a real option if a good drive is hit, especially to the right side of the fairway. If not, the lay-up, must still be accurate to leave a good angle to the green, which is easiest if hit long and left of the water. Camarillo Springs Golf Course Hole 18: The last hole of the day has a tough tee shot with no shortage of water to the left. If it can be managed, the approach shot to the green is fairly wide open, although the green has a tier separating the back from the front.